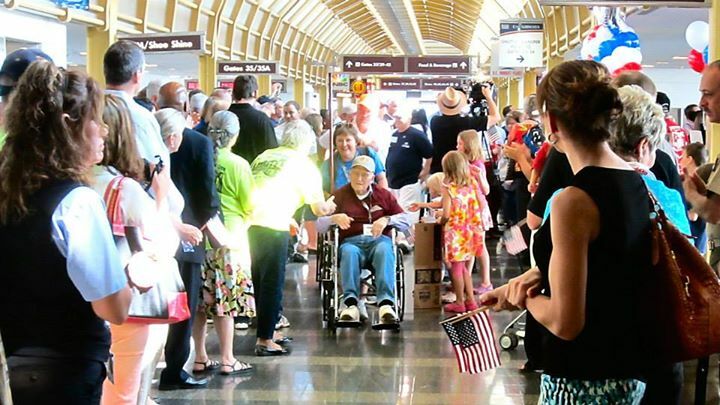 Honor Flight DCA Reagan National Airport | Volunteer to Greet Honor Flight Veterans at DCA and the World War II Memorial! Over 10,000 Veterans Each Year! 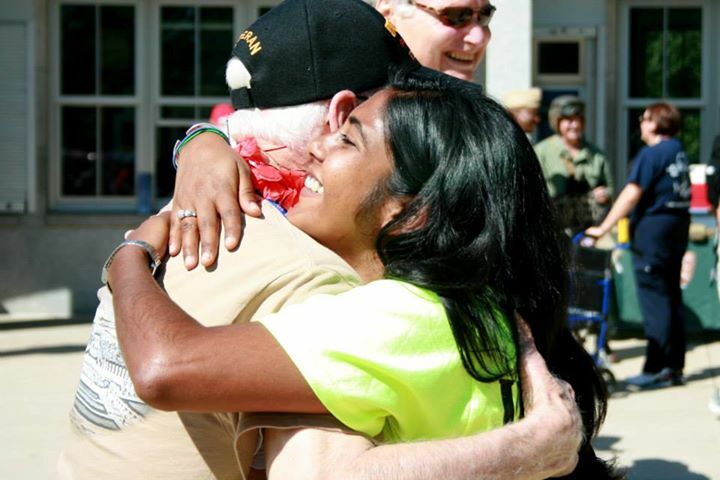 We are so excited that you are interesting in volunteering with Honor Flight. The Honor Flight Network flies Veterans from 140 hubs here to Washington, DC to visit their Memorials at no cost to the Veterans. The easiest way to volunteer here is to greet our Veterans as their flight arrives at the airport or their buses arrive at the WWII Memorial. 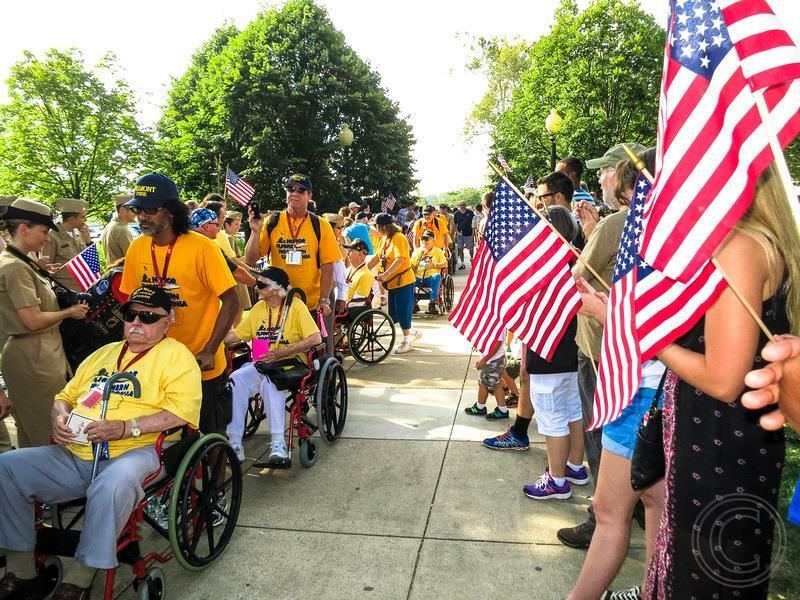 Our group is 100% made up of volunteers who donate their time to greet our nation’s Greatest Generation as they arrive to DC on their Honor Flights. These World War II, Korean War, and Vietnam War Veterans generally arrive in the spring and the fall, allowing the Veterans to escape the more severe temperatures of summer and winter. Total Veterans to DC since 2005: 221,850!!!!!!! 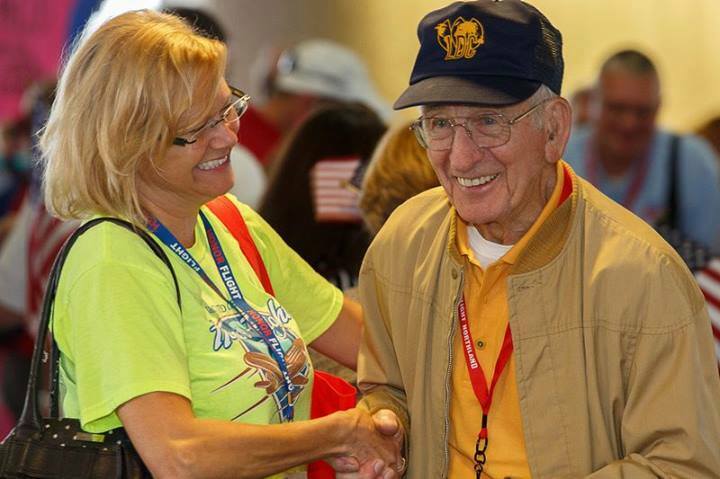 There are several ways to volunteer with Honor Flight DCA Volunteers, including greeting the veterans or serving as a guardian (volunteers who accompany individual Veterans throughout the trip). For more information about these opportunities, please check out our Volunteering section. Thank you for your participation and for bringing others–your family, coworkers, and friends to welcome and honor these Veterans! 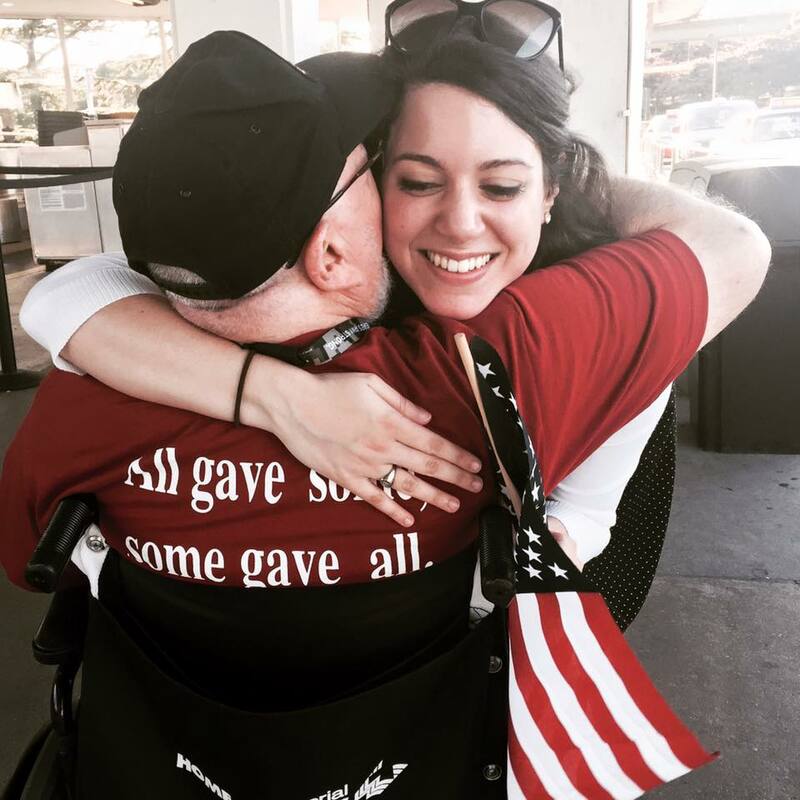 This could not be done without you –and the Veterans often report that these greetings are their favorite parts of the whole trip! Your questions not answered here? 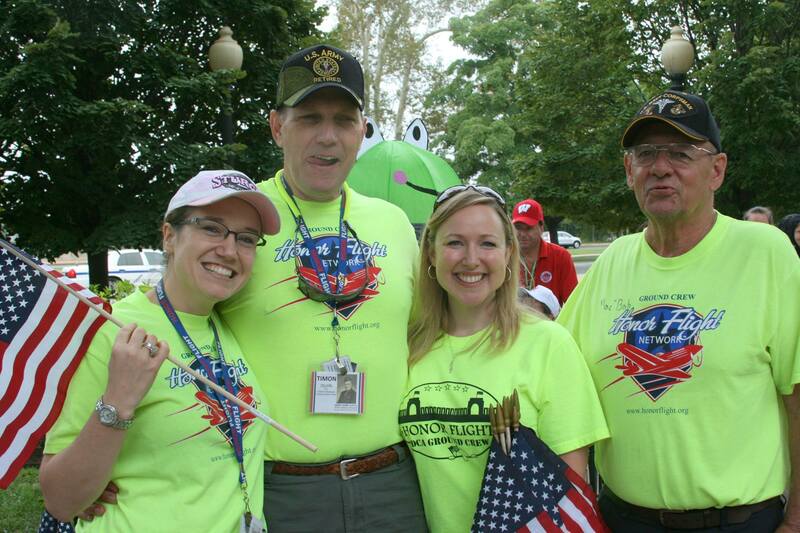 Contact us at dca.honorflight@gmail.com! GOAL: Helping every single veteran in America, willing and able to board a plane or a bus, to visit THEIR memorials. PRIORITY: Top priority is given to America’s most senior heroes — World War II era veterans, and any veteran with a terminal illness who wishes to visit THEIR memorial. The program will naturally transition to Korean War, Vietnam War and all other veterans who served, on a chronological basis. ELIGIBILITY: All men and women serving stateside or overseas. PHILOSOPHY: Since America felt it was important to build a memorial to the service and the ultimate sacrifice of her veterans, the Honor Flight Network believes it’s equally important that these Veterans actually get to visit and experience THEIR memorial. I volunteered at Dulles for several years as a greeter until I moved to Charleston, SC three years ago. We have a flight from the lowcountry coming on September 12, 2015. I have signed up to greet them at DCA. I have chosen not to be a guardian in order to give someone else the opportunity to live this wonderful experience. I am so excited to be a part of honor flight once again! Thank you for all you do for our veterans!! God bless you and I look forward to September. You hosted a group from the Kansas City area last year, which included a veteran named Carlin. When he returned, he honored us with a picture of him as a young man in uniform which we greatly enjoyed. The next time we saw him he apologized for being so bold as to mail those pictures and we all told him how much we enjoyed them and asked about his visit. He told us about the wonderful reception he received when he landed and then he mentioned the women who held a sign which said free hugs. He told how he went over and got more hugs than all the hugs he had received since his wife died all roll together. It broke my heart, and not just mine but everyone who heard. But his story was not one to sadness but of joy, he was ecstatic that he had such a wonderful time. Thank you for doing this for so many men and women who have earned our respect and our love. A trip to D.C. is one of my top priories. The WW11 Memorial and Vietnam Vets Memorial top of the list. My Dad a WW11 Veteran, Battle of The Bulge P.O.W. 106th Infantry Division 423SVC. Did not live to see this. He knew about it. We would read of this during our trips to V.A. Hospitlas all the time. But in his honor and Memory we are trying to be there this summer. My Forever Hero. God Bless each and everyone of you. My thoughts, heart and love are with you all. Thank you for your service to our country and our freedom. The ZEBRA newspaper ran a short story (page 11, Nov. Issue) on a recent Honor Flight landing at Reagan National Airport. It included 3 photos of the event. I would like to Know the process for entering my husband, Ken E Moore, as a candidate for an Honours Flight. He served as a USMC SErgeant in The Vietnam Conflict. We reside in Midland TX. I would be honored to become a volunteer welcoming these heroes to our Nation’s Capital. I moved to the D.C. area last year from Louisiana. I joined others sending delegations off for this wonderful opportunity and then welcoming them home. The Veterans’ Hero Flight is such a wonderful opportunity for all of the men and women who dedicated their lives for our freedom. I wish there was a chapter in north Louisiana so I could volunteer in this great gift. I was at DCA this morning as part of a company sponsored volunteer event. What a great experience. This is something I will make sure to do again. Seeing the vets come through security and have smiles on their faces when being greeted with cheers and waving flags warmed my heart. It was a small gesture but started my day and hopefully their day in our nation’s capital on the right foot! I will encourage my teammates and friends to do this! I have attended three different honor flights at Reagan national airport. It was an honor to greet the veterans coming to DC. I hope to continue these blessed events and would love to bring my great grandchildren with me. I want them to cherish and experience these events.